Nel asks Oscar if Reeva was a neat person. He answers that she was in some senses. Her car was a mess but her room was well kept. 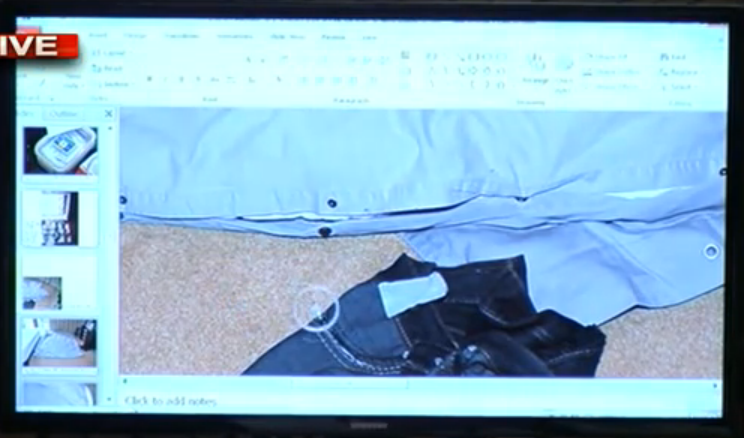 Nel points out that Reeva’s clothes in the overnight bag were neatly packed. The only thing out of place was the pair of jeans on the floor. Nel wants to know why and Oscar says he does not know. Oscar points out that her “slops” (slippers) were on the floor too. Nel says that those were neatly put next to the bed on the left hand side. Nel asks, did she sleep there the night before? Oscar says she slept at his house but not on the left hand side of the bed. She slept on the right. Nel wants to know why her slippers would be on the left side. Oscar says because there’s more room on the left of the bed, the right side is cramped for space. Oscar says she always kept her stuff on the sofa when she slept over. Nel asks if she used the slippers when she got up from bed. Oscar isn’t sure. He says he had seen her wear the slippers before walking around downstairs, probably because the tile was cold. He doesn’t remember her wearing the slippers that day. Oscar points out that the jeans on the floor were inside out so it’s likely that she just took them off and threw them on the floor. Nel says but all of her other clothing is neatly packed inside of her bag, except for this one item, and if she was leaving that day why wouldn’t it be packed? Oscar doesn’t know. Nel asks him, “where were they when you got in to bed?” Oscar says he doesn’t remember. Nel says that it’s the State’s position that she wanted to leave and they were both awake, they were not sleeping. Oscar says that’s not correct. Nel says there was an argument. Oscar says that’s not true. Nel wants to know if Oscar has an explanation for the stomach contents of Reeva. Oscar does not. He says he does not have an explanation for it so he can’t comment on it. Nel points out that Professor Botha, the defense pathologist, conceded that most people would expect the stomach to be clear 6 hours after somebody has eaten. We are dealing with 8 hours in this case, according to Oscar’s testimony. Oscar still says they had dinner just after 7pm that evening. Nel reminds the court that Mrs. van der Mewre heard a woman’s voice starting around 2am that morning. Oscar acknowledges that he heard her evidence. 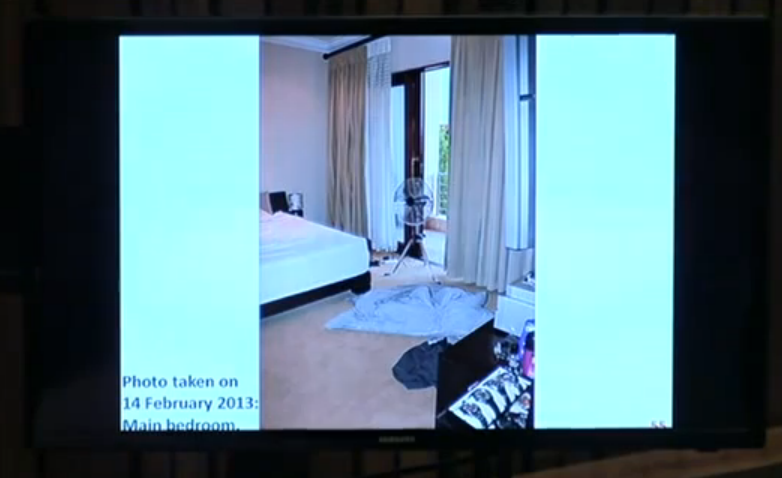 Nel says that it’s possible her evidence fits in with Reeva eating within the two hours prior to her death. Oscar says they did not eat at that time. Nel tells Oscar that is impossible. Roux objects and says that the word impossible cannot be used here. He should instead say that it would be expected. Nel rephrases saying that all references to medical works, and both experienced pathologists, said that one would expect the stomach to be empty after 6 hours. Nel asks Oscar how can it be that there is food in Reeva’s stomach. Oscar says he’s not sure. Nel tells him that’s not possible, he was awake. 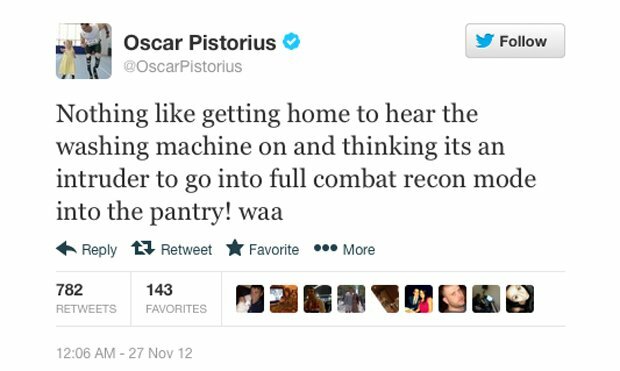 Oscar says him being awake has nothing to do with Reeva’s stomach contents. He goes on to say that Mrs. van der Mewre heard a woman’s voice, not a man’s so he doesn’t know. 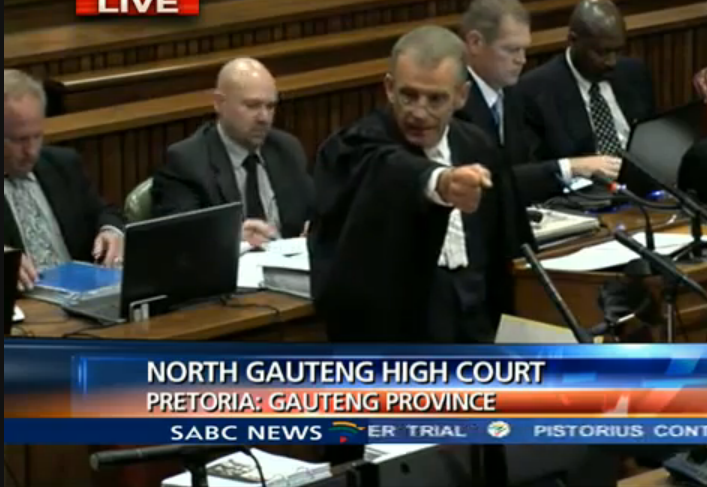 Nel stops him and points out that he’s arguing his case again, and it’s not good for his credibility. Oscar accepts that. Nel wants to know if it’s a possibility that Reeva ate while he was sleeping. Oscar says it’s a possibility, he doesn’t know. Nel tells him that he’s tailoring again and Oscar says to the Judge that if he wanted to tailor his evidence he would say something different. He knows that eating just after 7pm doesn’t suit his case but that’s when they ate. Oscar says it’s improbable that she did. Nel says it’s not improbable, it’s impossible. Oscar says he doesn’t want to argue the point. Nel says he does. Nel finally points out that the alarm would have been triggered. That is why it’s impossible, not improbable. Oscar says if Reeva had switched off the alarm and went downstairs to eat and then came back up, he doesn’t think he would have known since he was asleep. But he does not think she went down. Nel tells him this is a devastating fact for his case. Oscar says he doesn’t have an explanation. There are two important things here that Nel is getting at. The stomach content issue speaks for itself. We all understand that. But the other important thing that Nel is pointing out is that Oscar can’t keep up with his story. If Oscar’s story was true, and Nel posed that question about whether or not Reeva could have eaten that night, Oscar would have likely answered that no, she could not have gone to eat without him knowing because the alarm was on. Nel asks Oscar if Col. Van Rensburg was the first person who went upstairs. Oscar says he doesn’t remember who went upstairs first. He remembers an officer asking if anybody was in the home. He was in civilian clothing. He remembers Hilton Botha going up twice. He doesn’t remember who went up at the same time or which rooms they were in together. But he agrees that Van Rensburg was one of the first there. Nel asks again, can you deny Col Van Rensburg’s evidence that he was the first to go up? Oscar says I don’t know, he can’t confirm or deny. Nel wants to know if Col Van Rensburg is lying? Oscar says no, he can’t deny it. Oscar then says he can take it in to consideration, he can’t confirm his evidence. 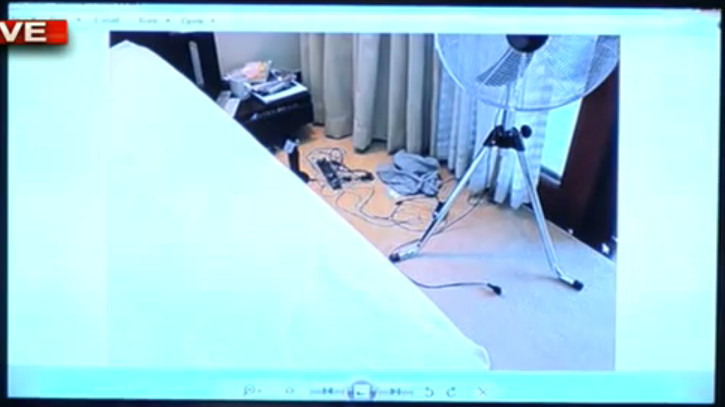 Nel points out that Van Rensburg testified that his focus was on the tripod fan in front of the door when he went upstairs. Oscar cannot deny this, he was not there. Nel reads through some of Van Rensburg’s testimony from court about how they stopped at the main bedroom and what they noticed. 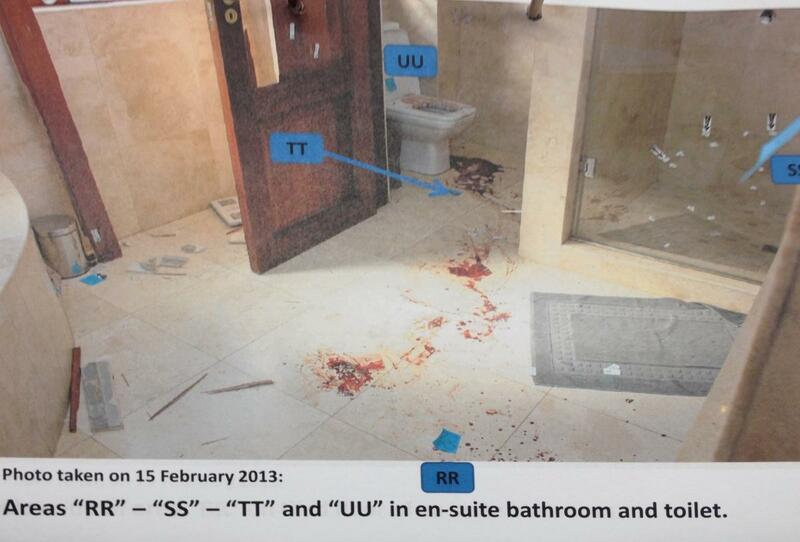 Roux had shown the following photo to Van Rensburg during cross examination and asked him if this is what he saw. Van Rensburg said no, the fan was not standing there. It was standing in front of the door. It was standing more right. Roux asks, do you know who moved it there? Van Rensburg says no, I do not know. 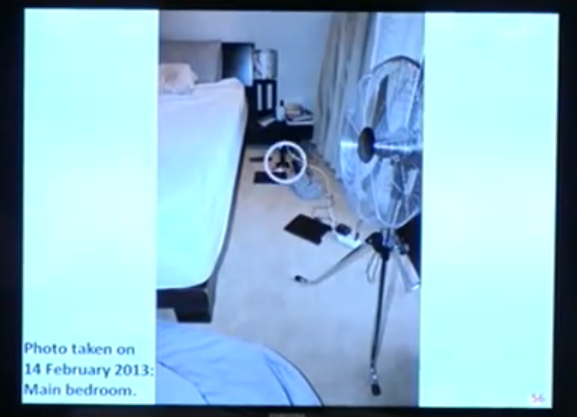 Van Rensburg was describing that the fan was actually where it is seen here in this photo. The photo that Van Staden took to depict the scene exactly as it was when he arrived on Feb 14th. Nel then asks Oscar why Roux would not have challenged Van Rensburg with Oscar’s version that the fan was actually in front of the bed. Oscar is not sure. Nel tells him because it’s a tailored version during cross-examination. Nel also points out that where Oscar is saying the fans were in his cross-examination is not the same as what he said in his chief. Oscar says he doesn’t remember. 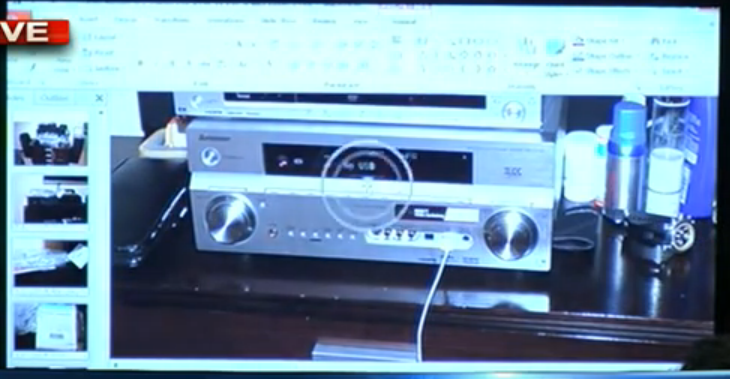 Nel asks him if the blue LED light, the on/off switch of the amplifier, was the only light seen in the room that night. Oscar says that’s correct. Nel asks, anything else? Oscar says there’s a tiny light on the light switch on the wall but it doesn’t give off any light. Nel asks if he picked up the jeans to cover that light. Oscar says yes. Nel asks Oscar if he knows what the blue light means on his amplifier. Oscar is not sure. Nel informs him that when the amplifier is off the light is red and when it’s on the light is blue. It seems odd that Oscar wouldn’t know this, but I suppose it’s possible he never noticed. Nel also informs Oscar that his amplifier was on that night. Oscar doesn’t remember if it was on or off. Nel points out that there are other lights on that amplifier that are illuminated when the amp is on. Nel asks Oscar if it’s true that the blue LED light detail was not in his bail application nor was it in his plea statement. Oscar says that’s correct. Nel also points out that the blue LED light was never discussed by Roux with Van Rensburg or Van Staden. They now look at photos of the stereo together. Nel wants to know what the white cord is that’s attached to the system. Oscar says it’s an Apple charger for iPhones and iPads. Nel asks him if he used it that night. Oscar can’t remember. Nel now points out the other lights on the front of the amplifier (there is a row of 6 lights on the bottom portion.) Nel asks Oscar why those other lights didn’t bother him. Oscar says because the blue light was a lot brighter. Nel then points out another blue light in the picture. The white circle depicts where the other blue light was. Oscar says this other blue light didn’t bother him. Oscar says the blue LED light, the on/off button, had bothered him before. Nel asks him why he didn’t just switch it off. Oscar says he’s not sure if the light goes off when you turn the system off. Nel asks him, did you try it? Oscar says he doesn’t remember. Nel says, why wouldn’t you? If the light is bothering you, why wouldn’t you try that? This whole LED light discussion seems like a silly argument on the surface but this does actually have significance. The sequence of events that occurred in the exact moment that Reeva got up to go to the bathroom without Oscar seeing her, relies on what he was doing during that time. He had never spoken about the light bothering him and needing to go over to cover it with a pair of jeans until cross-examination. It wasn’t in his bail affidavit and it wasn’t in his plea explanation. Roux obviously was never told this portion of the story by Oscar because he surely would have discussed the amplifier and jeans evidence with the police officers who testified, as well as with Oscar in his chief. Defense attorneys, and certainly not one that’s as good as Roux, don’t leave out details. They work very closely with their clients to know and explain every single detail of the incident in question, even the minor ones. Nel points this out to Oscar and tells him that he’s trying to buy time in his story. Oscar denies this. Here’s what I think… According to Oscar’s bail affidavit, he had to go outside on to the balcony to retrieve the fan. But we all found out in court that really wasn’t the case. The two fans were primarily inside, and Oscar never had to go outside at all. He just moved them to a different location. In light of that, there is a very small window of time between when the curtains where closed and the room went pitch black, and Reeva could have slipped away without Oscar noticing. I think as Nel was cross-examining Oscar, he realized how truly small that window of time was and bought himself more time in the story. That’s what Nel was referring to when he made the comment about time. Nel also points out a red light on the bottom of the TV. Oscar says this light didn’t bother him. 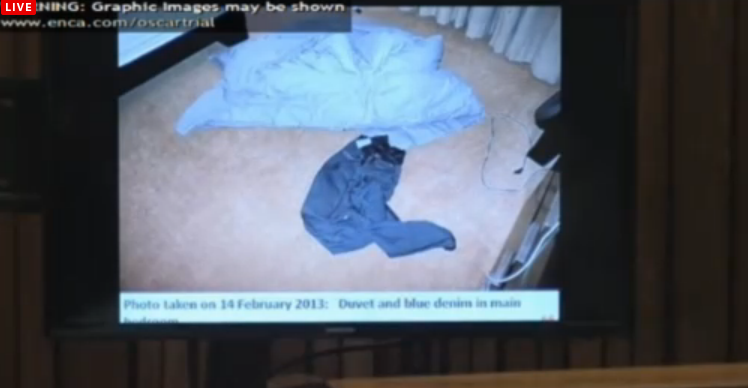 Nel then focuses on the duvet, jeans and carpet and points out where the blood spatter was found. It’s very hard to see on our TV monitors at home but he pointed it out and Oscar acknowledged. 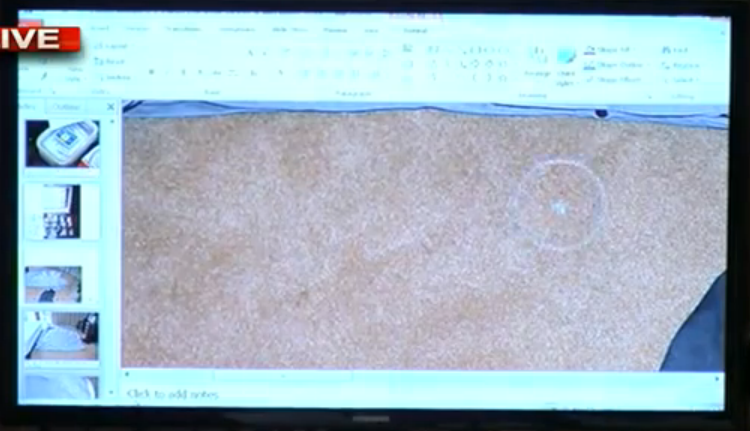 The white circles depict some of the areas where blood was seen. These are just some of the spots, not all of them. The spatter appears to go down the duvet and on to the carpet. 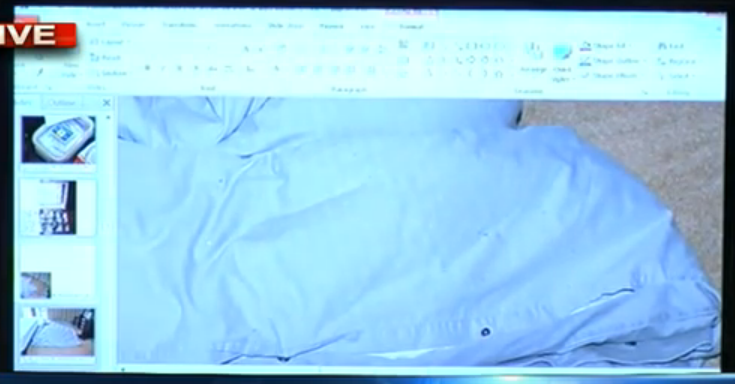 It suggests that the duvet was always there – it was never moved by the police as Oscar claimed. 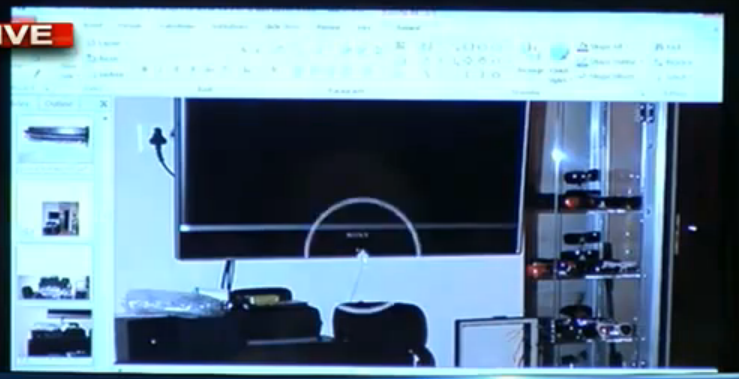 Nel also shows Oscar the watch case that was on top of the speaker closest to the bedroom entrance. They look at the blood spatter on that. Nel says that the blood on the watch case, carpet and duvet was a result of when Oscar carried Reeva out of the bathroom and through the bedroom. Those items were not moved by the police prior to the first picture. If the duvet is in that position on the ground, Oscar never would have been able to run back and forth to the balcony as he stated in his version. Oscar even admitted on the stand that the duvet on the ground is a problem for his version. That’s why he was insistent that it was on the bed and the police moved it. 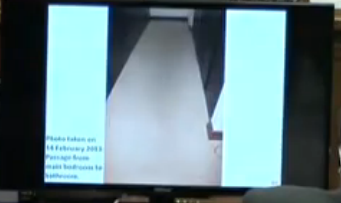 I believe that Nel crushed his theory of those items being moved by police prior to photographing. Oscar says that after he pulled Reeva out of the bathroom, he went to go get his phones which were next to the bed on the left hand side. He says there was also blood spatter on the wall next to the bed where he retrieved his phones, so it’s possible that the duvet could have gotten blood on it at that same point as well. When Nel points out to Oscar the overwhelming evidence that the duvet was on the floor, he wants to know if Oscar will agree with him. Oscar’s answer now is “I don’t remember the duvet being on the floor.” This is vastly different from insisting that it was on the bed. Apparently at this point during testimony Oscar’s eyes were bothering him and he was rubbing them, and Nel asks him if something is wrong. The Judge steps in and says that she is aware of it. She was noticing him rubbing his eyes about 10 minutes ago. She said she has been watching the witness. It’s important that they keep doing this because they have to make sure that Oscar is fit to be in that box. Any indication of physical or mental impairment could cause an appeal so they are going to be careful about any potential issues. Nel then shifts focus and wants to know what Oscar said to Reeva after he armed himself. Oscar said “get down and phone the police.” Nel asks in what manner did he say it. Oscar says in a low tone. Nel says, definitely not a whisper? And Oscar says no, he remembers saying it in a low tone. Nel then asks, if somebody said that you whispered would that person be lying? Oscar says yes. Nel points out that he testified that in his chief that he whispered to Reeva. But now Oscar is saying that he spoke to her in a low tone. The two are different. Nel goes on to say that if you whisper to somebody it would be harder for that person to hear you. When you whisper to a person, you are likely facing the person and whispering TO them in order for them to hear you. In Oscar’s version, when he got his gun from under the bed, he said he never looked at Reeva nor leaned over toward her yet he was convinced that she would have heard his instruction to get down and call the police. How can he be convinced of that if he did not face her and only whispered? Again, it seems like a silly argument but it is actually relevant. It’s not logical that if he had his gun and was walking to the passage with his back to her that he would whisper and she would hear it. Nel is trying to show that he changed his testimony to accommodate this detail. Nel then asks if Reeva said anything else to him other than asking if he couldn’t sleep. He says no. Nel wants to know why she wouldn’t ask him where he was going when he got out of bed. In keeping with that point, if she was awake and asked him “baba, can’t you sleep” and he said no he can’t, chances are she would have followed that up with “where are you going” when he got out of bed. I can see this both ways though. I don’t necessarily think its a strong point. Nel jumps now to the first noise that Oscar heard when he was in the bedroom that night. Oscar says the first noise was the window opening. He had no doubt he knew what it was. He heard the sliding and he heard it hit the window frame. Nel says to Oscar that if Reeva was in bed, she would have heard it too. Oscar agrees that she would have. Nel asks, would you have expected her to say something? Oscars says no. Nel asks why not. Oscar believes that if she heard that window opening too, she would have been as scared as he was. And when he said get down, call the police, she would not have engaged in conversation. Nel says he doesn’t agree with him. He says it’s improbable. Nel says the other issue is that Oscar didn’t identify the noise during the bail application. Oscar said he heard a noise, he didn’t identify it. Nel asks him if he was so convinced that he knew what the noise was, why would he not have put that detail in his bail statement. That is an excellent point. Nel points out to Oscar that he is very astute to pick up on details when Nel makes a mistake, which means he clearly is paying attention and knows what he’s saying. But then he turns around and claims to be confused and making mistakes when he is cornered with difficult questions. Nel asks him why would he not have been “equally keen” to point out specific details in his bail affidavit. Oscar answers that when his bail affidavit was done it was done by his legal team, he was in a holding cell, he was on medication, he was traumatized. He read it and it was the truth so he signed it. There was no understanding that it needed to be an exhaustive statement. Nel tells him that it was not expected to be exhaustive, but they do expect him to say what he heard. Nel is absolutely correct here. If Oscar is going to claim that his immediate terror was caused by hearing the window opening, and that terror lead to him killing a person, it makes no sense whatsoever that he didn’t specifically say that he heard the window open in that statement. Oscar will not convince the court on this one. So Oscar then says, he stated in his bail affidavit that after he heard the noise and went in to the bathroom, he saw the window open and that confirmed what he heard. But Nel calls him out on this and says he’s tailoring again. Just a few minutes ago Oscar said that he heard the window open while in the bedroom and he had no doubt at all that he knew what he heard. And when pressed on why he didn’t report it that way for his bail, he is now trying to say that seeing the window open confirmed it for him. They are two different things and it really looks terrible for him when he does this. I know some people believe that he’s just under duress, which I’m sure he is, and making mistakes because of that. But if you look at this pattern throughout the last 5 days on the stand, it is extremely clear exactly what he’s doing. He’s not telling the truth so he is constantly in a position to make things fit. He twists and changes things when the questions get difficult. At other times he has an amazingly detailed memory. Nel then asks him if he was traumatized when he signed his plea statement for court and he says he was not. He was on medication but he was not traumatized and acknowledged that he read it and signed it. 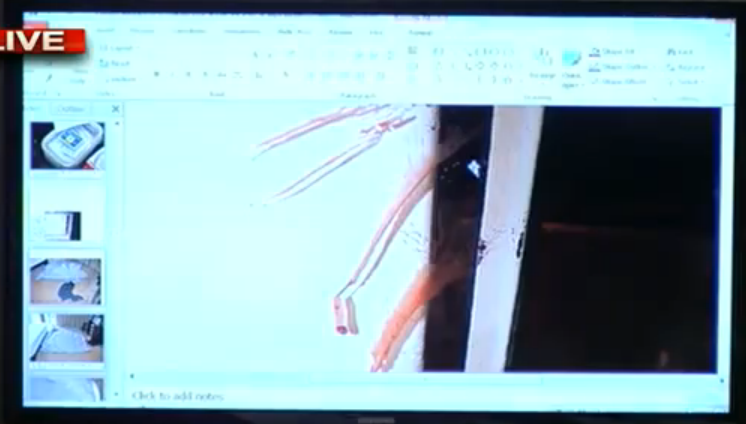 Nel points out that the detail about the window slamming open and hitting the wood frame, that Oscar so clearly pointed out had helped him to fully know what he was hearing, was not included in the plea statement. Nel wants to know why. Oscar doesn’t know why. Nel tells him its because he never told that detail to his legal team. Oscar says that’s not true. 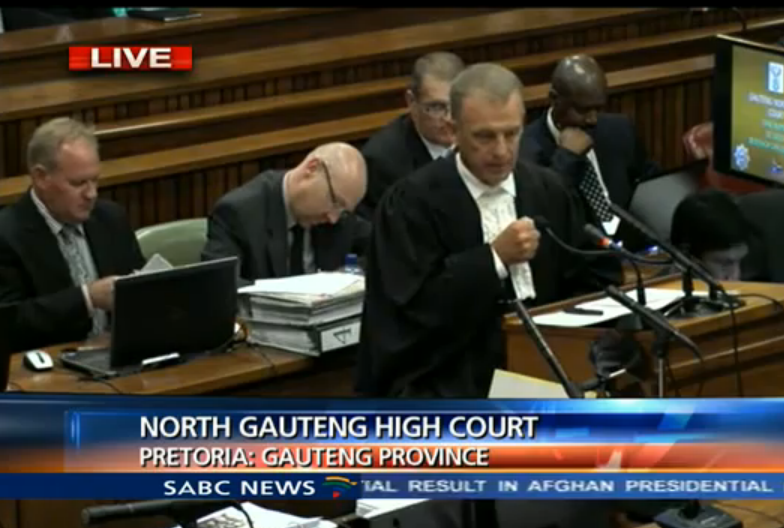 Nel tells him there is no way that his legal team would deliberately keep that out of the statement. Oscar says he doesn’t think so; he has trust in his legal team. Oscar doesn’t understand it. 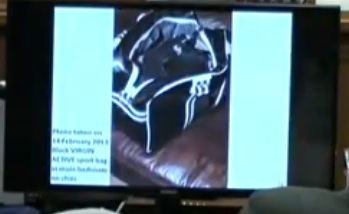 Nel inquires in what position was his gun. Oscar says, “in a ready mode, aimed in front of me.” Oscar also says, “not ready to shoot, in front of me.” Nel establishes with Oscar that he was scared. Oscar confirms that his elbow was bent by his side, but his arm was in a forward direction. Nel demonstrates. Oscar says his arm was not fully extended. Nel demonstrates what a fully extended arm would look like. Oscar says he wanted to chase the people out of his house. Nel tells him to continue on. He says he peered around the corner, he had stopped shouting, and he had already heard the door slam. Nel stops him and says no, tell me what happened when you got to where the passage begins. Nel asks him if he could see something. Oscar says he could see a little bit of light. If somebody had come out of there he would have been able to see their silhouette. Oscar says there was more illumination in the passage than the bathroom itself. Nel is trying to refocus him again to go back to the portion of his story that left off at the beginning of the carpeted passage. He asks him Oscar if he was in the bedroom facing the passage and Reeva walked down the passage, would he have seen her? Oscar says yes, he would have seen a silhouette. The Judge adjourns for a few minute so he can get himself together. When they return Nel asks him why he got emotional about what he shouted to the intruders. Oscar says because it was a traumatic night and he was terrified. Nel says to him that he was emotional because that is what he shouted at Reeva. Oscar says no. Oscar says, “I’m traumatized by the event and by repeating those exact words I’m reminded about that night, what I felt in that evening.” And then quickly says, “morning.” He really caught himself on that one. Nel wants him to continue on. Oscar says he was shouting to Reeva to call the police. Nel wants him to tell the court exactly what he said to her. Oscar says “Reeva, call the police.” Nel asks, so you were shouting her name? Oscar says “I think that’s how I remember it.” Oscar clarifies that he shouted to Reeva first, and then he shouted to the intruders. 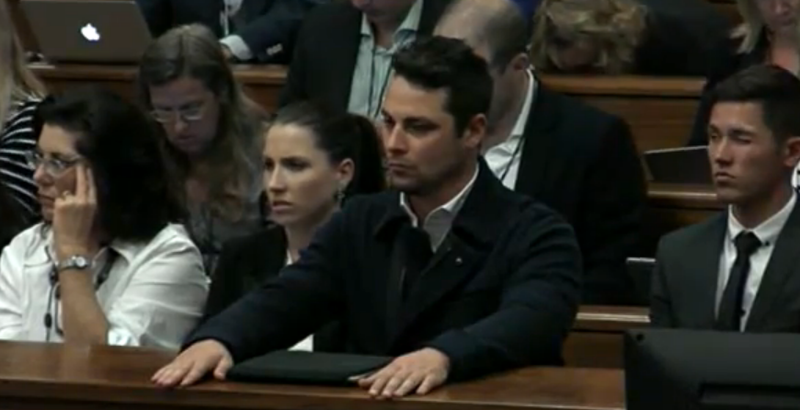 Nel asks him why he needed to scream to Reeva at that point. He just spoke to her in the “soft tone” at the bed telling her to call the police. Now he is only a few more feet away in the passage and nothing else has happened so why suddenly start screaming at her to call the police. Oscar says that he felt he was now in a safe place to protect Reeva and if he shouted that out he was hoping that the intruders would be scared knowing that Oscar was awake, in close proximity and that the police were being called. Nel wants to know if this is what he remembers or is it a reconstruction. Oscar says he remembers it. Nel tells him this doesn’t make sense. You were just behind a wall, wouldn’t you be safer there? Now you are in the open passage where anybody could walk down toward you but suddenly you’re not too scared. Oscar doesn’t see it that way. He says he was protecting Reeva and he felt safer going towards them. Nel says so at first you didn’t scream in the bedroom because you didn’t want to put Reeva’s life in danger. But as you are getting closer to the danger, it’s safer to scream. It doesn’t make sense. Oscar says he was terrified in that bedroom and when he was in the passage he “didn’t have a choice.” He wanted the danger to come through him. Oscar adds in that he was hoping they would leave before he’d have to confront them. Nel asks Oscar if he was waiting for a response from Reeva? Oscar says no. Back to the passageway, Nel wants to know if his arm with the gun is in the same position as it was before. Oscar says he never had an extended arm. He wanted to keep his firearm close to him because if somebody came around the corner they could grab the firearm or grab his hand. Nel points out, so… you had time to think about that. Nel wants Oscar to explain again how he was holding his gun. He makes a stance and asks Oscar if this is how it was. Oscar gets agitated now and says no. He says it was in his right hand, his chest was facing the cabinets in the hallway passage (because he had to hold on to the wall with his left hand to balance since he was on his stumps). So he couldn’t have the gun out in front of him because his chest was toward the cabinet. He goes on to say the gun was never in one position. It was moving as he was “struggling” to get up the passage. I’m not sure why he says he’s struggling. According to his own story, when he got out of bed on his stumps he walked over to the fans and moved both of them, closed and locked the doors, closed the drapes, went over to the stereo to put jeans over the LED light and never once did he say he had to “struggle” to do those things. To the contrary, when Nel asked him in testimony if it was difficult for him to close the doors and curtains on his stumps he said no. The best they are able to establish after a few go-arounds is that his elbow was bent and the gun was in a forward position. Nel wants him to continue on. Oscar says when he got to the very end of the wall in the passage, he looked in to the beginning of the tiled entry to the bathroom. Nel asks him if he could see at this point. Oscar says there was no light coming in, there was light outside, but he was able to make out the outlines of things. He moved in to the tiled hallway of the bathroom at that point, his gun still pointed forward, and he was leaning against the right wall. He walked all the way to the end of that wall and paused before getting to where you can see around the wall in to the bathroom. Just around the corner of that wall to the right are the sink basins. He peered his head around the corner of that wall. When he saw that nobody was in there he took a step or two backwards so that the wall on his right was blocking his view of the shower and basins. He could only see the toilet door and window from that vantage point. He says he stood there and started screaming again.Nel tells him that there’s something very important that he forgot. Oscar can’t remember what he has forgotten. Nel tells him he never mentioned the door slamming. Oscar gets upset and says he told him that happened way before in the passage before he went in to the bathroom. But he did not say it on this accounting of the event. Nel was prompting him to give each detail as he went along and he did not mention it this time around. Oscar says, “my Lady, it’s on record from this morning.” Nel tells him he is incorrect, he did not speak about the door this morning. Oscar does not agree and Nel offers for him to read the record from today. He asks him if he would like to do that and Oscar says no I would not. Roux objects and believes that Oscar did mention it earlier. He would like to take a few minutes to read the record and the Judge suggests that he does that over the lunch break. I know that Oscar has discussed the door slamming before so I think that Nel is wrong on this point. They continue on. Nel asks him if he screamed to Reeva before or after he heard the door slam shut. Oscar says after. This is either a contradiction or a very bad mistake for him. I’ll tell you why. First, Oscar has testified that he heard the door slam as soon as he got to the tiled entrance of the bathroom passage. He has also testified that he was screaming to Reeva as soon as he got in to the carpeted passage leading to the bathroom. So he was screaming at her before he got to the tiled portion. Now he is saying he didn’t scream to her until after that door slammed shut. So he tripped up on that inconsistency. But the bigger problem is that under Oscar’s version, he theorized that the reason Reeva was locked in that toilet room and stayed quiet the whole time was because she heard him shouting for her to call the police. She has to hear him shouting first before she can slam that door and supposedly hide. Saying that he only screamed to her after the door slams doesn’t make sense for his own theory. Oscar now replies, “It was in the process of shouting, it was after I screamed for Reeva but it was in the process of me shouting for the intruders to get out of the house.” I think he has now answered this question three different ways. Nel points out that the noise of the door slamming was not included in Oscar’s bail affidavit and wants to know why. Oscar says he mentioned it to his legal team and he can’t explain why it wasn’t included. Nel says that’s not all. Even more devastating, it’s not in your plea explanation. Why? Oscar says he understands what Nel is saying but he’s not sure why. Nel tells him because you “invented it” and you never told your legal team. Nel now wants to know what he noticed about the bathroom. Oscar says he noticed that the window was open, that there was nobody in the bathroom, and the toilet door was closed. Oscar says there were “many, many thoughts going through his mind.” He thought somebody might come through the window or stick a firearm out and shoot at him. He thought somebody may be in the toilet preparing to come out and attack him. He’s thinking of all the possibilities. Nel asks him if he thought somebody was in the toilet and he says yes. Oscar then heard a noise come from the toilet. Oscar heard what sounded like the door opening, it sounded like wood movement. Nel wants to know what he means by “wood moving.” Oscar says the frame of the door was a handmade frame and it made a clicking noise. Oscar says “that’s what I thought I’d interpreted that noise to be.” Nel asks him if he could see the door and he says yes. Then Nel asks if he could see the door move? Oscar says, “I had fired before I could see the door move.” Nel stops to note that. Nel asks him in what position he held the gun. He says it was still in front of him, he was still holding on to the wall and leaning. Nel stops him and wants to reconfirm how he is holding the gun. He asks, it’s bent and pointed towards the door? Oscar says yes. And Nel says, but you didn’t extend your arm and point and aim? Oscar says no he didn’t aim. 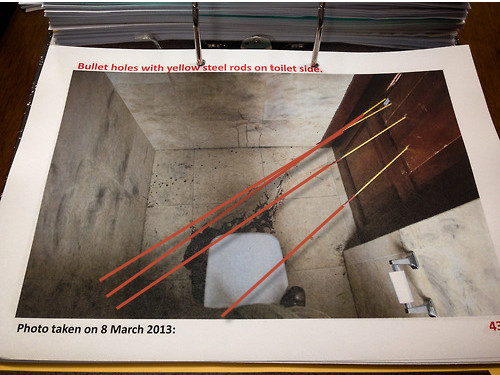 Here is the trajectory of the bullets from the inside of the toilet room. With this trajectory, Oscar was clearly standing closer to the basins shooting at an angle. I believe that one could debate that these shots were aimed. Oscar will not concede to “aiming” at the door but he will agree he was “pointing” at the door. Nel asks what happened next. Oscar says he heard the noise and he discharged his firearm. Nel asks why. Oscar says because he thought somebody was coming out to attack him. Nel says, “so you wanted to shoot the person coming out?” Oscar says he didn’t want to shoot anybody. Nel asks him what he wanted to do. Oscar says, “I didn’t have time to think. I was terrified.” Nel says to him that this is the first time throughout the whole scene that he’s not thinking. He was thinking every step of the way up until that point. Nel then asks, “isn’t your defense that you thought that you were in danger and you wanted to shoot the person that put you in danger.” Oscar says no. The Judge tells Nel that is two questions. Oscar says no. He heard a noise and he didn’t have time to interpret it so he fired out of fear. Nel says if that’s the case, then it was an accidental shooting and he doesn’t understand his defense. Nel asks Oscar if he understands that he can’t have two defenses. Oscar says he understands. Nel says the way he understands the case is that Oscar acted in putative self defense, which essentially means that he perceived an attack and that he fired at the attacker to kill them or to ward off the attack. Nel informs him that his defense has now changed from putative self defense to involuntary action (accident). Oscar says he doesn’t understand the law; all he can do is tell the court what happened. When faced with the notion that he just messed up his defense, he changed his answer. Nel says to the Judge that the witness is emotional again and requests a break, which is granted. Upon returning, Roux lets the Judge know that he and an attorney from the State reviewed the record and Oscar did indeed mention the slamming door in testimony. Roux also says to the Judge that Oscar is clearly getting upset by certain portions of the testimony and he feels that the State is repeatedly covering those areas with him. He feels that this is unfair. Nel strongly objects. He says to the Judge that Oscar’s emotions cannot be blamed on him. The Judge says to Roux that she does not believe that it is repetition. She would have stopped Mr. Nel if she thought it was. That was the end of that argument. Nel says that he is going to argue that he thinks the reason Oscar got emotional was because he got his defenses mixed up, not because Nel asked him if he wanted to shoot Reeva. Nel points out to him that on Friday, on one or two occasions, he asked him if he wanted to shoot Reeva and he didn’t burst in to tears then. So why today? Oscar says he doesn’t know. He doesn’t even understand the laws. And Nel says that’s why you got emotional. Nel wants to know if shouting “get out” should have caused Reeva to respond? Oscar says he doesn’t think so. Oscar does not remember shouting for Reeva to call the police while he was inside the bathroom, before he fired the shots. He only remembers yelling it in the passage. Nel confirms with him that he never said the words that he was armed and he was going to shoot. Oscar says that’s correct. Nel wants to know why. Oscar says because he never intended to shoot and he didn’t want the person to know that he was armed or what his position was. He didn’t want to scare them and have them react. (This is a specific thought that he had). But then he finishes his sentence by saying “I didn’t think about that, that I must not tell this person I’m armed, at the time.” It’s a contradiction of what he just said in the same sentence! Nel states that he was in control of the whole situation. His evidence itself indicates a person in control. Nel asks him what combat mode is and wants to know if he recalls a Twitter message he posted about that. Oscar explains that it’s a mindset that you train in. When a situation occurs, you go and seek out the perceived threat. Nel asks him if that’s what he did. Oscar says that’s what he tried to do. He continues that he didn’t have his prosthetic legs on like he did when he was being trained. Nel asks him, “you’ve been trained?” Oscar says yes, Mr. Rens testified about that. 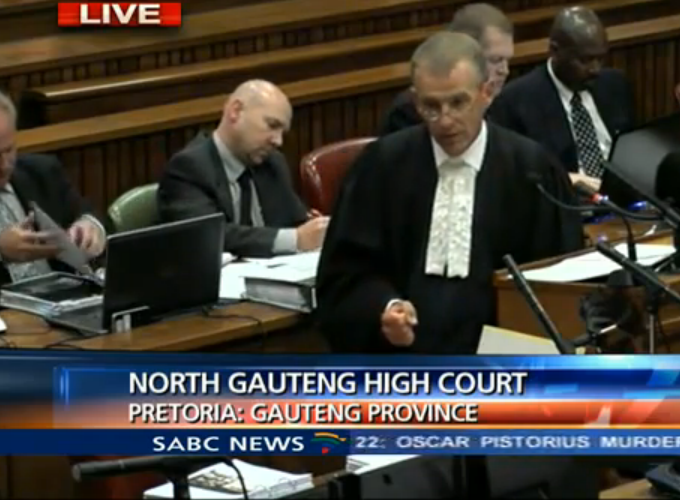 Nel points out to him that being a trained person, the court will expect him not to fire under these circumstances. Oscar says he spoke with Mr. Rens on the range about what one would do if one had a burglary, how would one go about clearing a room. Nel reminds Oscar that he put in his tests when he should shoot or not. Oscar acknowledges that. In every scenario, except one, the correct answer was not to shoot. Nel then goes back to the sound that Oscar heard in the toilet room. Oscar says it sounded like wood moving. Nel wants to know what that is. Oscar is saying he perceived it to be the door opening but Nel points out to him that we know that door was not opening. So Nel wants him to describe the noise; what is wood moving? Oscar says in retrospect he probably heard the magazine rack moving. Nel wants Oscar to take a look at a picture. 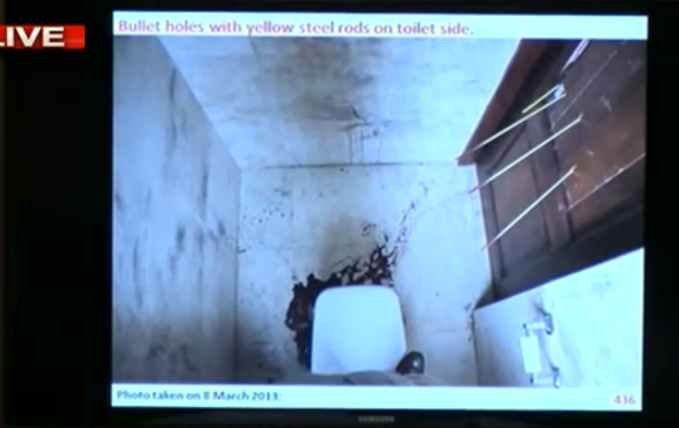 Nel points out that bullet hole A (the furthest to the right on this picture) is pointed toward the toilet. That is the hip shot, the first shot fired. Nel then asks Oscar if he heard Mangena’s evidence that Reeva fell on the magazine rack. Oscar says yes. Nel tells him the reason why he has now added in the sound of the magazine rack to his story is because he is tailoring from what he heard Mangena say. Oscar tells him he’s wrong. He wouldn’t have heard anyone falling on a magazine rack whilst he was shooting. 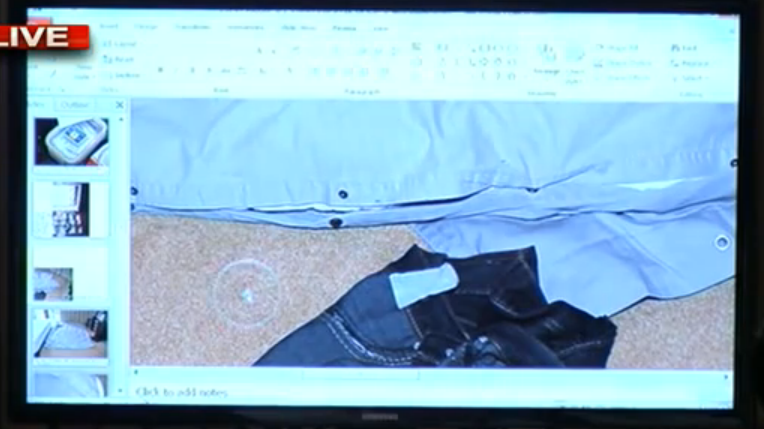 Nel points out to Oscar that his pathologist testified that the bullet holes where “quite a good grouping” meaning that they are all fairly in the same area. Nel wants to know if that was coincidence that they all ended up where they did if he wasn’t aiming. Oscar disagrees with his pathologist and says that over 4-5 meters distance, it’s not a good grouping at all actually. Nel corrects him; the maximum would be 3 meters. Oscar says, even more so then. Nel wants to know what Oscar’s ballistics expert will say about this. Oscar says he doesn’t know, basically says he doesn’t discuss this stuff with them. How does he not discuss his case with his experts and know what they will testify? Of course that’s not true. Nel asks Oscar, if you were yelling at the intruders to get out, get out, how were they going to get out? Oscar says by the window; they could have had a ladder at the window. Nel pushes him on this again and Oscar says he “didn’t have time to think.” Nel tells him that “I wasn’t thinking” is not good for him. Nel says to him, one of the ways they could get out was through the door. Oscar says that’s correct. Nel says to him, “you never gave them a chance, on your version, because that door never moved.” Oscar says that’s correct. Nel confirms with Oscar that he didn’t know how many people were in there, if they were armed, if there was a child in there. He says, you gave them no chance, you just fired. Oscar says that’s correct. He then has Van Aardt sit on the toilet. He wants to demonstrate that if Reeva had gone to the bathroom and left the door open, she was sitting on the toilet and then heard Oscar screaming, she would have to stand up and partially come out of the toilet room to grab the door handle to close it. Oscar may have seen her doing that since he stated he was yelling to her in the passage and would have been able to see figures moving. Nel wants to know why he never heard the locking of the door. Oscar says he’s not sure, maybe the door was slammed and locked at the same time. Nel says to Oscar that we have to think in all these things to make your version plausible. So Nel wants to deal with the shouting now. He confirms with Oscar that he screamed in both the passage and in the bathroom. He also confirms that Oscar fired the shots after that. Nel then refers to the Stipps’ evidence. He wants to know from Oscar if the first set of bangs that they heard (roughly around 3am) was the gunfire. Oscar says that’s correct. Now remember here – the gunfire is what woke the Stipps around 3am, not screams. Nel asks him are your screams what they heard before the shots? And Oscar says that his screaming is the only screaming they would have heard that night. Nel is trying to point out to him that the Stipps did not hear a woman screaming prior to the first set of bangs. So on Oscar’s version, his screams don’t fit what the witnesses heard. In order for Oscar’s version to work everybody must be lying. Oscar’s next sentence is interesting. He says, “if they saw the lights on after the first shooting, then that’s incorrect.” Perhaps he mistakenly said first “shooting” instead of first “bangs” but this statement caught my intention immediately. Nel then challenges him that the Stipps heard both a man’s and a woman’s voice screaming in between the two sets of bangs. Nel wants to know if that was also him? Oscar stumbles badly here and says “which shots”. He is acting like he doesn’t understand the question but the question is as clear as day. Was that your voice that they heard in between the two sets of noises. After a little go-around, Oscar finally understands the question. Oscar says yes that was his voice before the second set of bangs as well. Nel wants to know why he would be screaming after the gunshots. 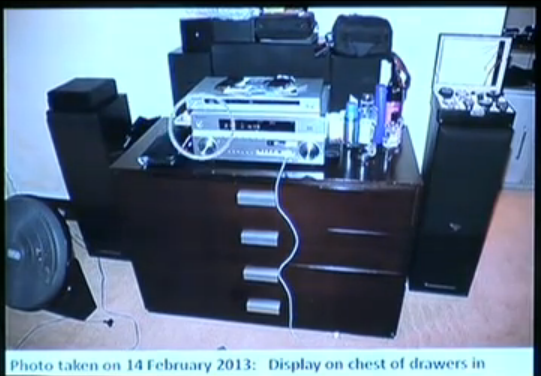 Oscar says he was yelling out to Reeva to call the police, after the gunfire, up until the time that he got to the bed. Nel asks him if he screamed while he was hitting the door with the cricket bat. And he says yes, he was screaming her name because he wanted to know where she was. Nel says, “so they heard a woman, but it was you.” Oscar says that’s correct. Nel asks him if he’s had his voice tested and he says yes. Nel asks him if he’s listened to his voice and he starts to say yes, and then he stops. After a pause he continues again saying he’s watched interviews and clips where he’s on the field and has shouted out. Nel says, so you have a recording where your voice is a high pitch and Oscar says no, he doesn’t have a recording. Nel then asks him if his legal team has a recording and Oscar says he’s not sure. How can he not be sure? Nel has to push him on this again; he wants to know if his legal team has a recording of him with a high-pitched scream. He then says yes they do, but he doesn’t. He clearly did not want to answer that question. Nel wants to know why this recording was never played for the State’s witnesses to see if they could identify his voice. Oscar is not sure but says that they have a witness who will be coming to testify about this. Nel asks Oscar if he was taken somewhere to record his voice and he says yes. Oscar says the recording was taken at the place where he currently resides. Oscar wants to add to the Judge that he has never screamed like that before, meaning that night. He doesn’t remember what he sounded like but that he was screaming after the gun went off, screaming out to Reeva, screaming for the Lord to help him, he ran to the balcony, he shouted and screamed for help and he doesn’t think that the screams would have all sounded the same. Nel then asks him if the sounds were screaming and shouting, and not just crying. Oscar says yes. This is an important point because in Roux’s direct exam with Oscar, they talked about the other closer neighbors who have in their statements that they just heard crying. So from this, it’s possible to make the inference that they only heard Oscar’s cries afterwards and not any of the screaming before or during the incident. We have not heard from these neighbors yet, we’ve only heard a brief description from Roux of what some heard, so I can’t say with any certainty how their statements differ from the State’s witnesses. But I see where Nel is going with this. Nel concludes that discussion by asking again if the Burgers heard a woman screaming, it must have been him and Oscar says yes. 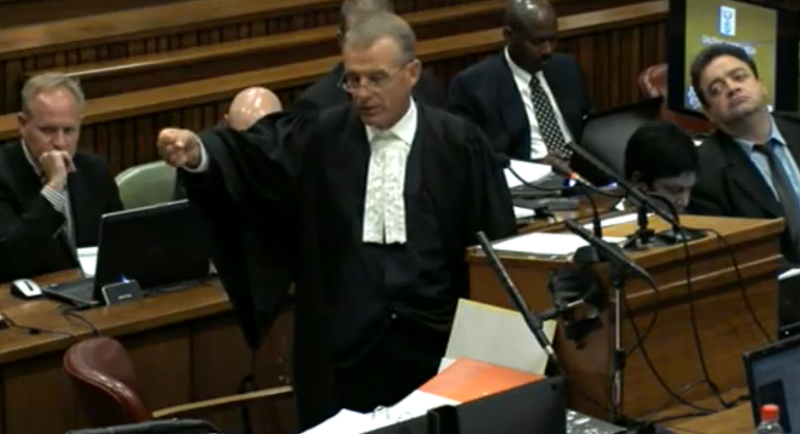 After a pause, Oscar points out to Nel that he doesn’t remember both Burgers testifying. He remembers both Stipps and he remembers Burger and Johnson but not both Burgers. Nel says to him you are absolutely right. There are not two Burgers; Nel incorrectly referred to the couple that way. Burger and Johnson are a married couple who go by different last names. Nel points out to the court how great Oscar’s attention to detail is. Nel asks Oscar how he fired and Oscar says that he fired in quick succession. Nel asks him how he knows that and Oscar says because he remembers. He discharged his firearm as quickly as he could. And Nel says, “and stopping?” He wants to know why Oscar stopped. Why didn’t he just empty his magazine, why stop at 4? Oscar says he’s not sure. Nel pushes again, if you just fired because you are scared, why just 4, why not empty the magazine? Oscar says he’s not sure. Nel then asks, “why not fire at the window?” Oscar then says he doesn’t know why he would fire at the window. Nel says because there might be somebody on the ladder outside the window (which was Oscar’s theory in the first place.) 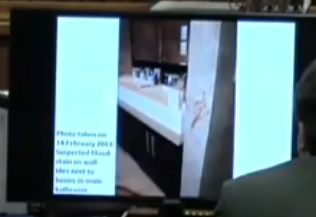 Oscar then says he thought there was somebody in the toilet so his firearm was pointed there. Nel then asks him if he ever thought about firing a warning shot in to the shower. Oscar says, “if I fired a warning shot at the shower it would have ricocheted and possibly hit me.” So Nel says to him you foresaw the possibility that if you fire that ammunition it could ricochet and hit somebody. Oscar then goes back to his standard answer, he wasn’t thinking. But he just outlined a moment before why he didn’t shoot elsewhere, because it would ricochet, and that illustrates that he had very conscious thought about what he was doing. Nel wants to know if he was pointing his gun at the danger and Oscar is just being evasive about giving a definitive answer on this. Nel asks him if he just got lucky that the bullets hit the door and Oscar gets very upset by this. He cries out, “how can that be lucky, she lost her life?” Nel says to him that he’s just trying to get emotional again and it’s not worth his while. They break for lunch. 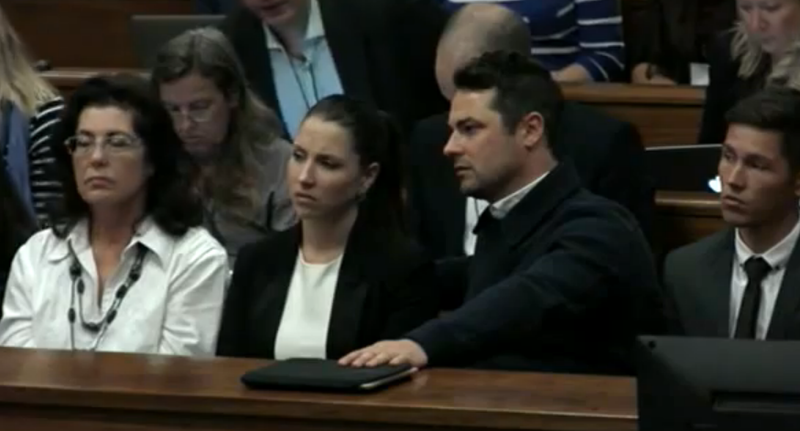 They are now discussing why Reeva had her cell phone with her going in to the bathroom and Oscar guesses that she may have used it for light and that’s why she didn’t turn the bathroom light on. Nel challenges him then, saying that he would have seen that light. Oscar says not if the phone was pointed towards her. Nel says no. In pitch dark, a cell phone used as a flashlight would have drawn his attention much easier than a blue LED light. Oscar says only if he was facing the passage and Nel says his peripheral vision would have seen it. Oscar is now testifying that often at night he uses the screen of his phone as a light and it gives him enough light to see where he is walking. Oscar does not agree with Nel’s peripheral vision comment, he says his back was to her and he would not have been able to see. 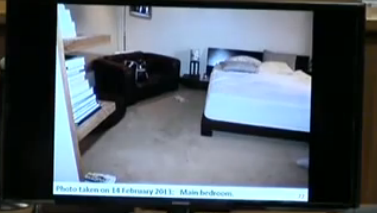 Nel points out in this part of Oscar’s story, he would be moving and placing the fans while Reeva is getting up to go to the bathroom. If he put the fans where he says he put the fans (where the duvet is seen on the photo), the passage would have been to his left if he’s facing the bed. And if he’s facing away with his back to the bed, then the passage would have been to his right. Nel points out to him that either way he has peripheral vision, his back is not to her during this time. Nel asks Oscar one last time how he held his gun when he fired the shots. 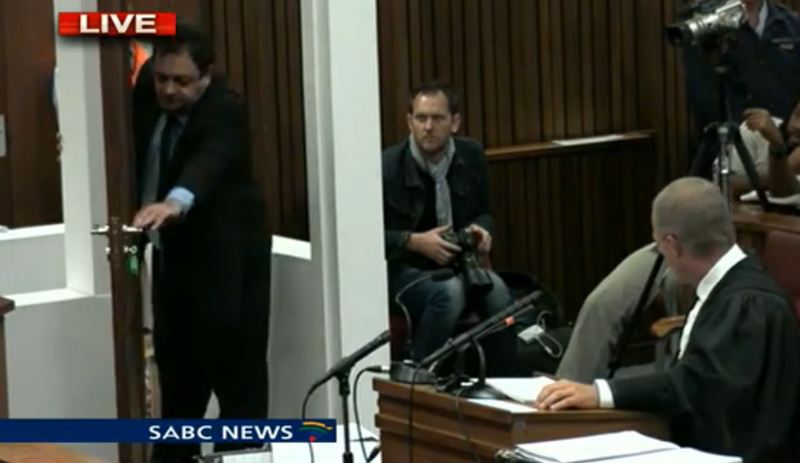 Oscar holds his arm up (which we can’t see because it is off camera) and Nel demonstrates the position that he is showing the court. Nel says to him that he now has his arm at normal shooting position and Oscar says that he does not think that is a normal shooting position. Nel asks, but it’s at least at shoulder-height? Oscar says probably around shoulder height. Nel says, you didn’t shoot from the hip? Oscar says the gun can be around shoulder height whether the arm is extended or it is bent. Nel is now looking at the door and asking Oscar how a person would have gotten out of the toilet, they would have to use the handle to do that. And Oscar testified previously that he believed they were coming out to possibly attack him. So Nel is now focusing on the door handle. Nel asks, if you wanted to shoot the intruder coming out, where would you have fired?” Oscar says probably higher, probably closer to chest height. Nel asks, if there had in fact been an intruder in the bathroom and he shot and killed them, would that have been an accident? Oscar says he never intended to shoot anybody. So Nel asks again, even if it had been an intruder, it would have been an accident? And Oscar says yes. Nel asks him who he blames for the accident. Oscar says he blames himself. Nel wants to know what the accident was. Oscar says he blames himself for taking Reeva’s life. Nel states to the court that the only position that Reeva could have been in behind that door was standing and facing Oscar in order for bullet A to hit her hip. Nel asks, why she would be standing there if she was afraid of an intruder? Oscar says he doesn’t know. Nel says because she was talking to you. Oscar says that’s not true. 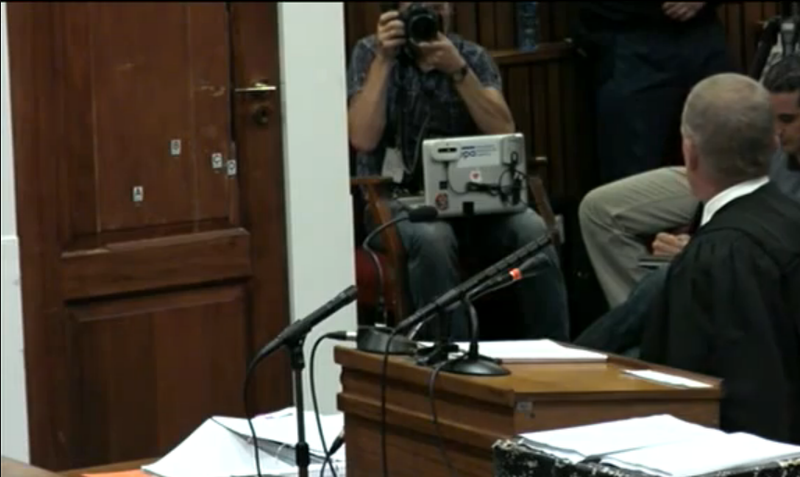 Nel asks him a few more times why Reeva was standing there and Oscar repeats that he doesn’t know. 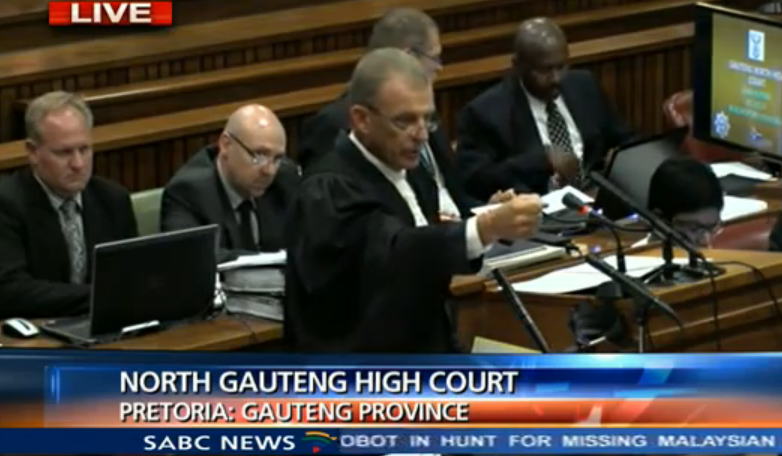 The Judge intervenes and tells Nel that the repeated question is unfair, he said he didn’t know. Nel then moves on to what happened after the gunshots. Oscar says after the shots, he stayed where he was for a moment and shouted out to Reeva. He kept his eye on both the window and the door. He couldn’t hear anything. He kept his firearm pointed in front of him. 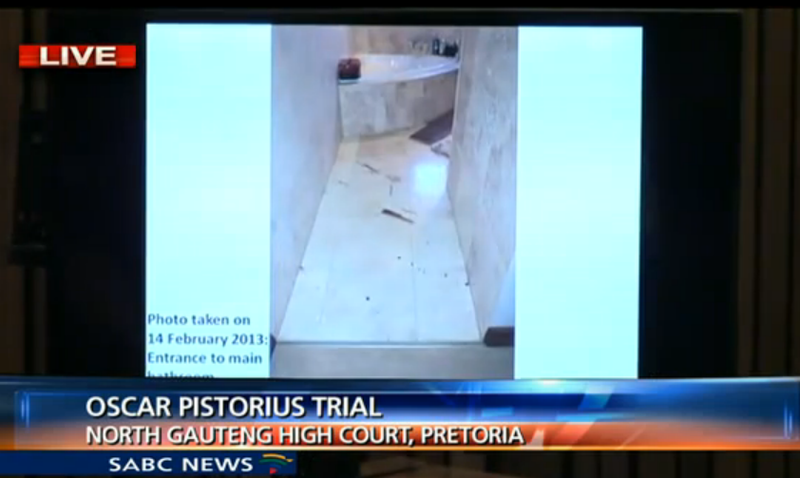 He slowly made his way back to the bed while shouting out for Reeva. Nel asks him if he was shouting or screaming. Oscar says screaming. He continues that he got to the bed and he realized Reeva wasn’t there. He climbed over the bed and got off on the right hand side. He stuck his left hand out to feel the curtains hoping that maybe she was hiding behind there. He started panicking because she wasn’t replying to him. He couldn’t see her or hear her. He went back to the bathroom as quickly as he could. He screamed as loud as he could. He was scared entering the bathroom again. He put his shoulder against the small wall between the shower and the door and he was trying to rip open the door which he couldn’t. On his stumps, he ran back to the sliding door and screamed for help. He then put his legs on and as quick as he could he ran back. Nel stops him and wants to address the details he’s just mentioned. Nel reviews with Oscar that he ran his hand on the curtain to see if she was there, he agrees. He also climbed on the bed to see if she was there and Nel asks, where was the duvet? Oscar is not sure. He doesn’t remember the duvet on the bed. Oscar says he went across the bed. Nel asks, if you went across the bed and there was a duvet on the bed, wouldn’t you have seen it? Oscar is not sure and says he doesn’t remember this part of the night. This again is in total contradiction to what he testified last week. Last week he was adamant that the duvet was on the bed and the police moved it to the floor. Now he seems to be very evasive about whether the duvet was on the bed or not. It makes no sense. Nel points out to him that according to his testimony the last time he saw her, her legs were under the duvet. Oscar wants to ignore this duvet now. He just says that he crossed the bed and he would have felt her she was there. He also says that when he got to the other side of the bed he was hoping she’d be on the floor as he told her to be. Nel says, “so you checked on the floor?” Oscar says yes. Nel says, “so you had visibility, you could see on the floor?” Oscar says no. Nel asks, then how could you see? Oscar says he felt with his hand. So Nel continues with this, if you are feeling with your hand you would have felt everywhere frantically, right? And he is stumbling with his answer again. Nel refocuses him. He wants to know what he checked first in the room and Oscar says the bed. And then next he says he checked the curtains. So Nel reminds him that you just said you wanted to check the floor where you told her to get down. Oscar says if she was there he would have tripped over her. So his argument is basically that he didn’t need to check with his hands because he would have just tripped over her when he was getting off the bed. That most definitely does not make any sense. Nel asks him if it’s strange that the clippers next to the bed on the right haven’t fallen over. Oscar says he doesn’t know if it’s strange or not strange. Nel says it is strange. You have now just placed yourself there walking around looking for someone. Looking at that photo, does it seem like he would be able to do that? Remember, he’s supposedly on his stumps as well. Nel points out that the clipper plug hasn’t become dislodged from the extension cord either. Oscar testifies that the fan was not in his way that night and he doesn’t recall tripping over any of the items on the floor. I do not see how that is possible and I’m sure the court will find that very unlikely too. Oscar says he then ran back to the bathroom. Nel stops him and asks him, “why did you not check if she left through the bedroom door?” Oscar says that the whole event took place in the bathroom so he didn’t think to check the bedroom door. Nel goes on to say that if Reeva’s not in the bedroom behind the curtains, the next logical place that one would look is the bedroom door. She just heard shots, wouldn’t it make sense that she ran out of the bedroom? Oscar says it didn’t even cross his mind. Nel says to Oscar that it’s the most unreasonable first thought that Reeva is in the toilet room if you haven’t checked everywhere. Oscar answers that you wouldn’t waste time looking everywhere. But Nel reminds him that you thought it was an intruder behind the door. That was your perception. Why would that change all of a sudden? And he goes on to say that this is why his version is so improbable. Oscar says that it first occurred to him that it could have been her in the bathroom when he first checked the bed, not when he was checking the curtains or the floor. It was the bed where it crossed his mind. This is why his next thought was to get back to the bathroom and not waste time looking around. Nel asks if he realized she wasn’t in bed when he got to the bed and Oscar says no, when he got up on the bed and crossed it, that’s when he realized. He also goes on to say that he really only needed to hold on to the curtains to balance himself, it wasn’t so much that he was checking them. It was really more about him putting his hand out to balance since the gun was still in his right hand. So now, according to his own admission, he didn’t check the curtains which he said he did 5 minutes ago on the stand. Oscar does not think it’s a big leap to go from thinking it was an intruder in the toilet room to thinking it was Reeva. Oscar is not sure why he was still carrying his firearm. He thinks he didn’t know what was happening. He went in to the bathroom and tried to open the door. He still had his firearm with him. He put his shoulder against the wall and tried to rip open the door. Nel asks him if he ever checked the bathroom window for the ladder. Oscar says he did not. Nel wants to know why not. Oscar answers that when it occurred to him that it might be Reeva, he didn’t think that she would have climbed out the window. Oscar keeps on, and says that when he realized the toilet door was locked he knew that somebody was inside there. And Nel says to him that it would be a huge leap at that point to think its Reeva and not the intruder that you perceived. It still could have been an intruder at this point. Oscar gets very weepy again and says his mind was on Reeva. 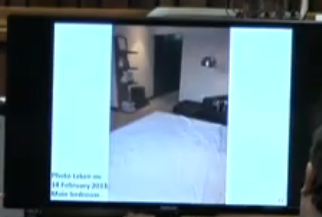 Nel is pointing out to him that on his version of thinking this was an intruder, it would have made much more sense to check the entry point first – the window – rather than thinking it was Reeva. Oscar, of course, does not agree. Nel asks him if he thought it was weird that the toilet door was locked and he says no, he didn’t think it was weird. Oscar says that his thinking at this point was that Reeva must have heard Oscar shouting, got scared, and locked herself in the toilet room. Oscar continues on with the story, he says he ran to “check” the balcony. Nel tells him he can’t get away with this continually saying he can’t remember, he’s made mistakes, etc. He tells him he’s being evasive. Oscar says at this time there was still hope in his mind that it was not Reeva. Nel asks Oscar, “did you check the balcony in hope?” Oscar says no, he ran out on to the balcony to call for help. Nel tells him that he still had to open the door. He wants Oscar to take him through the steps of leaving the bathroom to opening the door. Oscar says he ran down the passage past the closets and the bed. He doesn’t remember opening the curtains or the doors but he was on the balcony and he was screaming as loud as he could. He remembers standing there feeling helpless. Nel establishes he still had his gun in his hand. Nel asks, “so you were running with a cocked gun in your hand?” And he says that’s correct. Nel points out that it would be very easy to pull the trigger to fire with the gun cocked. And Oscar agrees. Nel says, you’re running in the bedroom, opening the curtains and opening the door and you have a cocked gun in your right hand? Oscar says, “I never said I opened the curtains.” Nel exclaims, “but you had to. They were closed!” Nel asks him, “did you open the curtains at all?” Oscar says he doesn’t remember opening the curtains. Nel asks him how it would be possible to unlock and open two doors with a loaded gun in your hand? Oscar says he’s not sure, he probably just held the handle of the door and opened it. Oscar says he understands how this sounds. He realizes how unsafe it was. As he looks back now at all he was doing he realizes the gun could have gone off and shot “me” or Reeva again. He says, “my mind wasn’t thinking about this gun in my hand.” He is weeping now. Every time Nel catches him on difficult details, he always starts weeping. Nel asks Oscar if he’s using his emotional state as an escape. He says no. Oscar goes on to say that he left the gun on the floor in the bathroom in an unsafe manner. If he was so cold and calculated, he would have put the safety on and put the gun away. He wasn’t thinking about the firearm. Oscar continues, when he came back inside from the balcony he put his prosthetic legs on. Oscar says he can put his legs on in about 30 seconds. He said he put them on quicker than usual that night. He was trying to find his socks on the floor. Nel asks him why he didn’t switch on the lights at this point. If he was looking for Reeva and hoping that it wasn’t her in the toilet, why not put on a light? This is a very solid point that Nel makes. It would make no sense in an urgent situation where you need to find somebody quickly that you don’t put on a light. Oscar, of course, says he wasn’t thinking. Oscar says he put his gun down next to him on the bed while he was putting on his legs. From there he ran back to the bathroom and tried to shoulder charge the bathroom door. Nel asks him if he took his gun along? Oscar says yes. Nel asks why (because at this point in Oscar’s story he thinks it’s Reeva in there). Oscar says he knows it doesn’t make sense and he doesn’t know why he took it. Nel tells him because his story is false. He left the gun in the bathroom after he shot Reeva. He fired the shots and he left it there. Oscar does not agree. I agree; there are several anomalies in Oscar’s testimony. Why do you shoulder a door which opens towards you? Or kick it, for that matter. Oscar had a gun, why not just shoot off the lock? He was acting in a fit or rage, that’s why. Then, what caused that deep dent in the metal panel of the bath? Why has no one ever mentioned that? I maintain; Oscar chased after Reeva with the bat. When she slammed the door shut and locked it, he bashed in the panel in fury and then took to the door. When he wasn’t successful, he hobbled back for his gun and proceeded to shoot Reeva, came to his senses when she’d stopped screaming, and then retrieved the bat again to pry the door open. That’s my interpretation, my lady. GREAT question about why he didn’t just shoot the lock off the door!! During the State’s case, one of the investigators (can’t remember who right now off the top of my head) testified that they did examine the metal plate and could not determine the cause of the dent. Therefore, no need to take it up with Oscar. They had no ability to refute any answer that he would give. 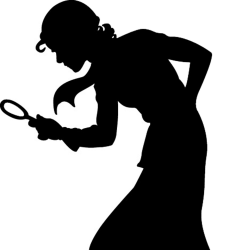 But… if one of the Defense witnesses brings it up on direct and gives an explanation, the State can then challenge them on cross-examination and test their assertion to see if it stands up. I highly doubt the Defense would bring it up though. It doesn’t help their case in any way that I can see. Ah! Thanks! Missed the panel bit. Another thing that bugs me is the blood spatters on the wall on the far side of the bed. There were also blood spatters on the couch in the lounge below the staircase. If O put R down at the foot of the stairs, how did the blood get to a room UNDER the stairs? Nothing was said about a blood trail. And, although there must’ve been a few severed arteries, I’m pretty sure blood couldn’t have spurted that far (as gruesome as that might sound!) But, I suppose, Gerrie pursues only that which incriminates O without any doubt. And, I think we’re all agreed, there’s enough of that! The blood that is seen on the arms of the sofa and chair downstairs is from dripping up above. It’s a little hard to tell from most of the photos but that portion of the furniture is almost directly below the landing area. With an arterial spurt from the arm, or with her long blood-soaked hair swinging back and forth, it actually could reach the downstairs fairly easily. Nel did state to OP while he was on the stand that it was their finding that the blood in those areas was from him carrying Reeva. 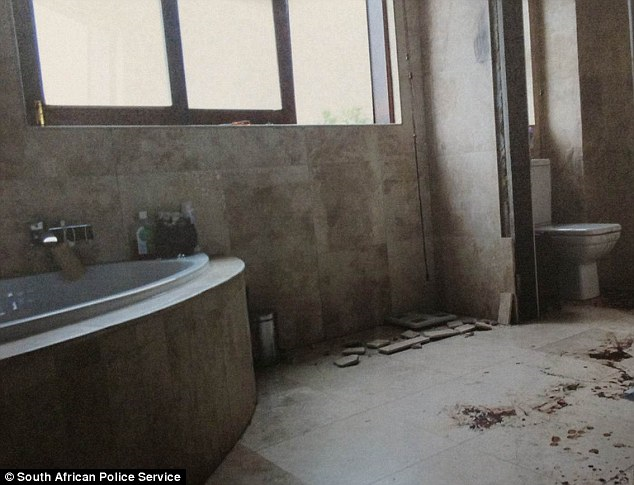 As for the blood spatter next to the headboard on the left, OP states that it could have gotten there when he ran to get his phones from the bedside table after pulling Reeva out of the toilet room. He says it was cast off. That is possible. The state has not presented a theory for that blood, it’s possible they accept OP’s theory on that. But the State did say that it is their belief that the blood spatter on the duvet, jeans, carpet and watch case in the bedroom was from when OP carried Reeva out of the bathroom and bedroom and down the stairs. It’s in reasonable proximity to the path he would have taken to make that finding. What!? You’re in a panic and you stop to put your socks on??? ps. I think you may BE the court reporter doing this on your off time. HA! Since writing my previous comment, I’ve learned that the “socks” he was referring to may be the “socks” he puts on his stumps before putting on his prosthesis. Somewhere I think it’s mentioned that Reeva has an iphone. It looks to me as though, at least one of OP’s phones (the one in the photo), is a white Samsung Galaxy S3. On a side note, as a non-iphone user, I had no idea that you could use one to make emergency calls even if it was locked. The same is probably true for my own phone and I don’t even know that. I’ve just read from Day 1 through Day 21, all in one sitting. I can’t tell you how ABSOLUTELY impressive, accurate and riveting, your account here is. It’s amazing. You’ve captured everything. Muzzle flash with the type of ammunition Oscar used is toward the lower end of the intensity scale from my understanding. Even so, in dark conditions it could still be a problem and at least something that would stand out. With shots in a room with the lights on when firing, the muzzle flash would not attract any significant attention. Oscar’s version has him in dark for a few minutes and shooting in the dark , after a period sleeping. Bearing in mind his eyes would be adjusted to dark conditions the effect of muzzle flash would be visually amplified to him. Also reflections of muzzle flash from in the bathroom would make things worse with windows, mirrors, glossy tiles and other glossy surfaces. In such conditions it would not be unusual for his vision to be affected for a while after the shots, including the first shot. The absence of mention of muzzle flash when firing his gun in his version of the incident is significant in that it questions the credibility of his account of firing the gun. A visually impaired Oscar would be a sitting duck for any imagined intruder on a ladder etc. Oscar’s choice of words and his verbal slips were very telling. I also picked up the quick correction from speaking about what he felt that “evening” to “morning”. He also spoke about when “I ate” and quickly corrected to when “we ate”. – He referred to the “closet” in the passage which I’m sure Mr Freud would have found interesting as we rarely use this term for cupboard in SA apart from the phrase “in the closet” – a clue as to what may have enraged him, perhaps ….? – He also let slip that he “knelt down” before he fired (on stumps?!) – I think the judge made a note – and he then went on to say he “sat over” Reeva in the toilet (!?). Yea, the kneeling thing has been bugging me for a while. Definitely implies legs on. The photo can be found on my post for Day 11 (March 17). I obtained this by just simply doing a screen grab from the video of that day. Hi, I am absolutely amazed with your blog, I am unable to follow live and this is a truely wonderfully informative way to catch up. Thank you!! Just something I picked up that gave me a bit of a chill and I quote what you have written: (Nel stops him and asks him, “why did you not check if she left through the bedroom door?” Oscar says that THE WHOLE EVENT TOOK PLACE IN THE BATHROOM so he didn’t think to check the bedroom door.”)If those were Oscar’s exact words, it pretty much sums up his entire lie to me. It all did take place in the bathroom, no fans, no doors, no curtains, no duvets, everything that caused him to shoot her happened right there in the bathroom. Almost as if its the basic truth tucked away in the big big lie. Nel asks him where the jeans were the night before when he went to bed and OP says he cant remember, but this is a lie because he testified that they were in the floor and he picked them up to cover the LED light just before he heard the very first sound so of course he knew where they were when he went to sleep because its were he found them when he woke because on his version RS was also asleep so its not possible for them to have from when he went to sleep to when he woke up. I also feel the way he added them into his version makes them stand out for me as having great significance that night, even Nel knows something was up with those jeans. If he told the “intruder” to get the F..K out of his house, and Reeva had just gone for a widdle, why didn’t she say “Oscar it’s only me”? Very strange she could not speak.